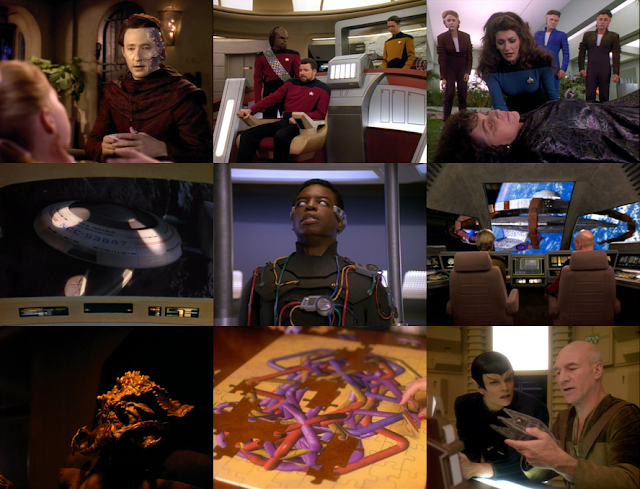 The final year of The Next Generation never managed to fully recapture the magnificence of the third and fourth seasons but that's not to say it didn't have some outstanding episodes to boot. Season seven often gets labelled as being too "family" orientated and we're not talking about a level of storytelling. Throughout these twenty-five stores there are a considerable number that feature some sort of family theme. 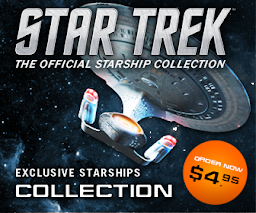 Lore, Lwaxana Troi, Geordi's parents, Data's mother, Wesley Crusher, Alexander, Worf's stepbrother, Picard's "son" and Beverley's grandmother all get crammed in - that's nine episodes out of the full season before anything else is considered. Comparing against the sixth year of The Next Generation the first half of the year is a lot less "high concept" and more about rounding out a lot of characters and issues from the back catalogue. 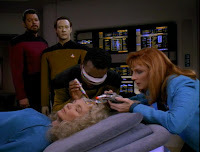 Geordi finally gets some kind of family (and a VISOR-free script for the most part) in Interface and Lwaxana drops in for her final Star Trek appearance ever in Dark Page however these are probably the lower keys moments of that segment. What I always think of when recalling early season seven is either Gambit or Phantasms. They are more unusual and the former should clearly have been a season cliffhanger what with Picard being dead for most of the first part. But once these gems are through and we've had our cellular peptide cake and eaten it, the year takes a deathly plunge almost right until the bitter end of the season. Why? Well, apart from the magnificent Parallels and plot-hole explaining The Pegasus it's all very...average. There's more Soong androidery going on, a pointless warp drive speed limit which is forgotten or sidestepped almost as fast as it's implemented and even more family meddling. Season five I noted heads for soap opera territory with its angst and issues but season seven almost tends to play it safe with a few absolute curve balls thrown - nay lobbed - in for a reminder of greater days. Let's not forget too that we get the closest we've ever got to the Beverly and Jean-Luc relationship that's been hanging in the air all the way back to Encounter at Farpoint and The Naked Now. Notably while it's an enforced relationship and builds on their frequently seen breakfasts or lunches together off duty, it would be something that the finale would touch on but sadly not in the most positive of lights after 25 years. In terms of Beverly this is her strongest moment of the season especially when you consider that her other starring role comes in the dreary Sub Rosa which frequents many a "worst of..." list. As you can tell the concept of tying up loose ends and stories and relationships was clearly stamped even at this stage in proceedings. Parallels was an instant classic which hinted at might have been's, should have been's and could be's. It's doubtless one of The Next Generation's later strokes of genius and hey, we'd never get to see Worf in command red again...oh...wait a minute.... Like the imperfect future in Future Imperfect, this episode is all about the background details, the subtle changes and the Borg-universe Riker's blatantly fake spy beard. 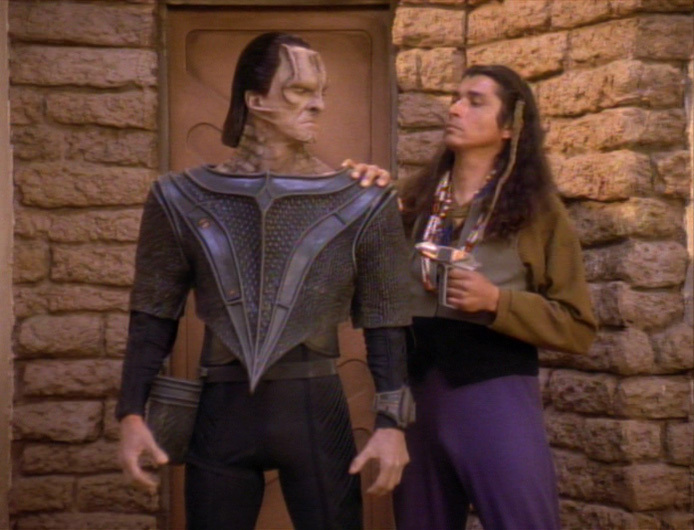 The Troi/Worf relationship was a great idea here but should have remained securely in a parallel universe. Luckily tactical officer Crusher does but we have a great time seeing all the permutations that might have existed in the show if things were a shade different. My favourite blink-and-miss is that one of the Data's has blue eyes instead of his usual yellow. See if you can spot it. The next episode, The Pegasus is an all-time favourite. 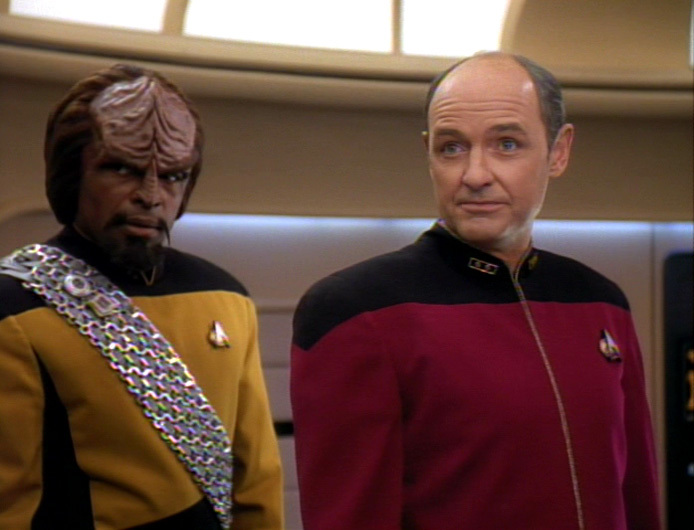 Secret agendas, Romulans, starships buried in asteroids and the highlight of Captain Picard Day are complimented with the addition of guest star Terry O'Quinn as Admiral Pressman. Another one of those characters I'd loved to have seen again. This has to be one of Riker's greatest moments alongside Frame of Mind and Second Chances. The interplay between Frakes and O'Quinn is priceless and seeing Riker torn between two commanders who have played significant roles in his career turns up the stakes. The whole package here is one of the best of the season and would put The Pegasus in my top ten of all time. Seeing the Oberth-class ship buried in the asteroid is one of those images that sticks in your head for a long time. The shame of these two stories is their proximity to Homeward and Sub Rosa. Neither set my DVD player alight with wonder and they fall heavily into the mediocrity category. At this point it's almost as if you can feel the cast counting the days until the show shuts down and principal photography begins on Star Trek: Generations. The zest and intrigue that existed even at the beginning of the year certainly feels like it falters here as a sub-par ghost story mars the flow and swallows up a rare opportunity for Beverly to shine. Luckily there is light at the end of the tunnel though as Lower Decks gives something very different. While Voyager attempted to copy the formula in its Learning Curve it never managed to hit the emotional resonance of this story. Focused on five lesser characters within the crew it adds a different perspective to the ship, allowing us uniquely to see how "the other half lives" as well as how they in turn view the senior staff that we as viewers have come to appreciate over the course of the show. 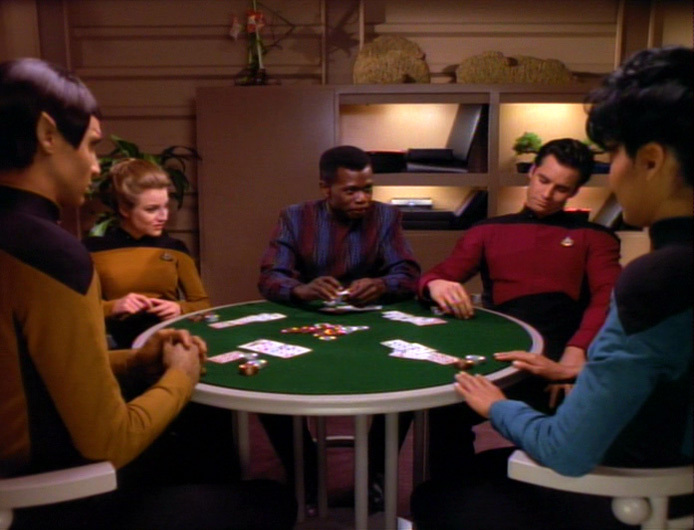 Resplendent with alternative, younger versions of some of the main cast and even including a poker game which shadows that of their superiors just a few decks away, it's one of the season's true high points. In a way this works perfectly because it's set in that last year of The Next Generation and I think we come to understand how unintentionally biased our viewpoint of the Enterprise and Starfleet might have become due to the eyes we have viewed the Star Trek universe through. This was for me the first hint that not everything was as rosy as it was intended to be even within the fleet, especially given the path that the story ultimately takes. Originally not an episode I was a fan of but one that I would now rate a lot more highly just because of the impact and realism of military operations that it successfully portrays. JJ Abrams doesn't get within a light year of this quality. The next few episodes are a real pick and mix of concepts though which adds to the uneven nature of the year. 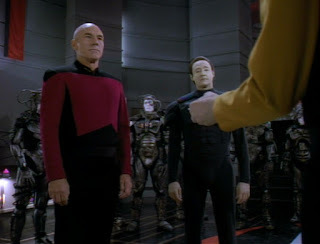 Remaining episodic rather than arc based as its siblings would evolve to become, The Next Generation tended to have points where it "went off on one" and I wonder if someone in the production office just thought "What The Hell" about episode 16. Data's memory loss is bizarre in Thine Own Self but does include one of my favourite makeup jobs of the whole run when the android gets a section of his skin cut away from his face. As with a few others in this season this is one of those that has aged very well and was a pleasant diversion the second time around. The trouble is these sparks of genius are permeated with some real draggers. Masks never rang true for me then and nor does it today. I actually found Spiner a bit nauseating in his portrayal of the alien characters and some of them verged on unintentionally comedic. Sorry Brent, probably one worth missing off the CV. 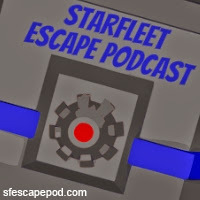 Eye of the Beholder is another mind-bender with a great look into the warp engines which makes up for the average plot as does the way in which it attempts to give us some history to the Enterprise before she left spacedock. 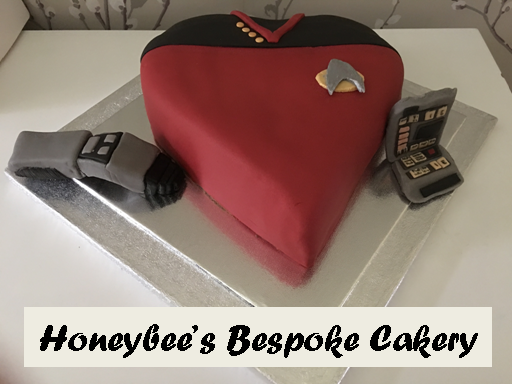 Not being very old by the time we saw her in Encounter at Farpoint it doesn't leave a lot to go on but here there is at least an attempt made even if it's down to a few boxes and some discarded work tools. 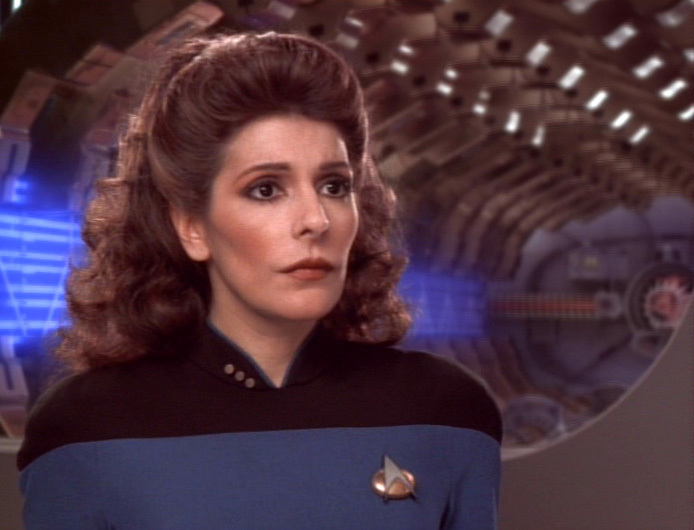 It's actually Troi's last time to shine in the centre of the spotlight but again, it's very tepid in its delivery. Murder, murder hunt, surreal solution, case closed. Also, is there something wrong with Deanna's face here? It looks like she's had some work done between Masks and this story. Of course that could be my imagination. Surreal certainly applies when we reach Genesis and while I have some fond memories of watching this one the first time around it hasn't aged particularly well. It's total hokum and you kind of feel sorry for Gates McFadden who had to direct this segment. Genesis does off a rare "wow" moment when Barclay slams up against the Engineering glass as he mutates into a spider and Worf as an armoured Klingon love machine is something to behold if nothing else. Now certainly this signposts that the final season is nothing if not unusual and there are more twists and turns than you might expect. There is, saying that, an evenness through the season. There's no initial batch of stunning ideas and right-on-the-edge stories before a massive drop off that happened with the sixth season and there seem to be a lot more episodes played for fun and entertainment. With the series coming to a close it's a lot more risky in the writing with more "off the wall" than playing safe. After all, it wasn't as if a drop in ratings would kill it. One thing that is evident towards the back end of the year is the push towards Deep Space Nine through both Journey's End and Preemptive Strike. 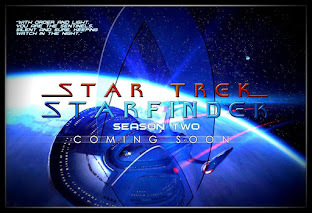 Originally aired in the US around the same time as The Maquis two-parter, it did help reinforce the links between the two shows and added something to the backstory of not only that show but also the upcoming Voyager which would use the Federation terrorists as a major part of its setup from day one. While I enjoyed both second time around it does feel they are here just to promote the goings on elsewhere in the franchise. Both Ro and Wesley effectively are written out in these two stories although neither with any dramatic certainty. I find them both compelling episodes which (while promotional) do illustrate that events are all interlinked across the Star Trek universe. In Ro's case it's only when she reappears that you realise she's been absent from the series since Rascals in season six and in the case of Guinan we won't see her at all this season; something you only click to when she turns up in Star Trek: Generations. Focusing on Native Americans is a good move in Journey's End as it does slap you round the face and remind you of similar incidents in our own Earth-bound past where peoples have been "relocated" due to border disagreements and the bloodshed that has so oft caused. 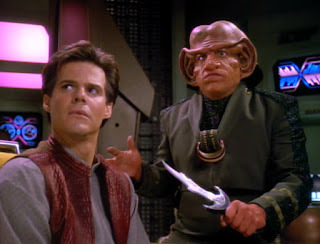 You can understand the flashpoint of the Maquis here and it's interesting that their creation should be grounded firmly within The Next Generation when others would manage the next chapters so deftly especially in a couple of later Deep Space Nine episodes namely For the Cause, For the Uniform and Blaze of Glory. Let's also not forget that the Maquis were aboard Voyager but their weight and prominence fizzled very, very quickly after Caretaker with only Worst Case Scenario truly delivering a "maybe" storyline of what the show could have been had it spurned the disciplines of Starfleet. It's an odd thing when you can reflect on a season in pairings and I can easily do that with these 25. The good episodes here are overshadowed by a mass of the average and poor sadly which is never how we would have hoped the swansong of The Next Generation would have gone considering its back catalogue. How many of these would have made it into the Top 25 featured in Starlog would be minimal with only a handful if that standing any chance of making the grade. Case in point being Firstborn which is abruptly followed by Bloodlines, both of which I still find instantly forgettable season fillers. Alexander (again absent since Rascals) taking centre stage just doesn't interest me and nor does Picard's "son" linked in with some plot harking back to The Battle and DaiMon Bok. These two do make you think how much time has been given up to rounding off storylines and making sure everyone gets some kind of screen-time no matter who they are. While this is great for a sense of completion and going full circle it doesn't make for good storytelling. Leave all that rounding off and time travel jinx for the finale thank you very much. Talking of rounding off, what would The Next Generation be without at least one final holodeck-based story. Why this device hasn't been condemned due to a slightly concerning safety record is always a good Star Trek debate but in Emergence its a help not a hinderance - and just in keeping with the theme of the season, it's totally bizarre mixing several programmes into one and ending with the ship giving birth. At least you can't say the final season was in any way predictable. It's actually quite a fun little outing with some great quirks - the gangster and his brick for one; the Orient Express in Data's The Tempest, Worf firing up the engine and the odd assortment of a gunslinger, a knight and a farmer all together in one carriage. That ticket collector wasn't taking any nonsense either. Looking at characters as we briefly did earlier, it is a year of returns and farewells. 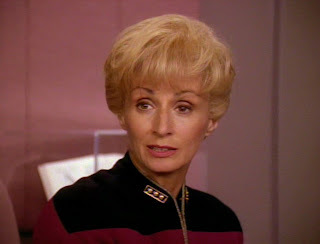 One person who does step back aboard the Enterprise on more than one occasion and would also graduate onto Deep Space Nine was Admiral Necheyev played by Natalia Nogulich. First appearing in Chain of Command, Part I back in season six her next appearance rounded off the year in Descent. Season seven would see her return twice and as with her scenes in Deep Space Nine they were linked in to the Maquis threat as she turned up in Journey's End and Preemptive Strike. What put me off a little bit was how she'd chewed out Picard back in Descent for allowing Hugh to go free and the captain had taken serious offence because he had believed his actions were right. When Necheyev arrives in Journey's End she's presented with canapes by Picard which just seems like he's sucking up to the teacher. Not Jean-Luc's greatest moment! I have to say though that Necheyev is a great character and her repeated appearances here do give the franchise and the Star Trek universe at this time a nice touch of continuity that this admiral seems to have been tasked with dealing with the Federation terrorists. Once she'd turned up in The Maquis, Necheyev would make one more "appearance" in The Search, Part II. A great addition to the guest cast and not an admiral to take any rubbish even from the captain of the flagship. What more could you ask for from a finale? 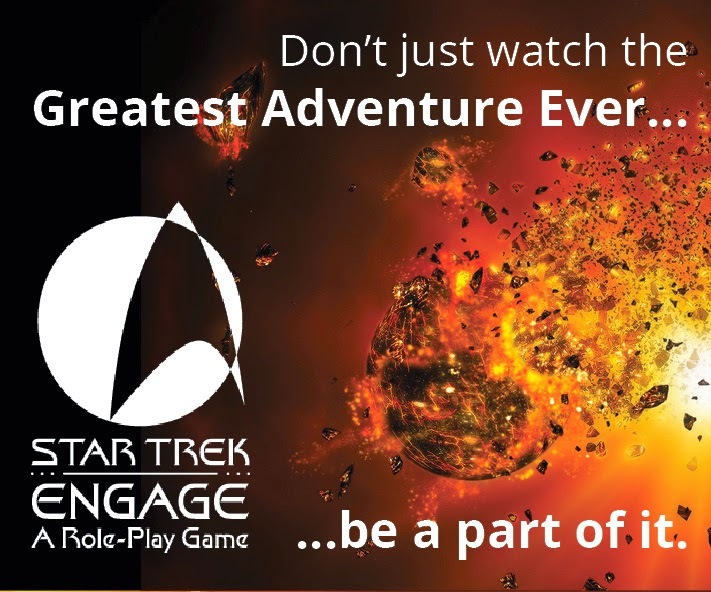 Double-length, time travelling, Q, new ship designs, more playing around with the timeline, the end of humanity - it has it all really and it seems like everyone has a damn good time while they are doing it. You can kind of forgive some of the more lame episodes from the final year because it feels that every last iota of energy and storytelling genius was rammed into this segment to make it as good as it is. 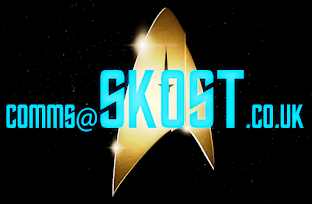 The Next Generation will always be the series that revived Star Trek's fortunes on TV and while there were some less than successful moments on the whole the quality was there more often than not. The final year is very much about saying goodbye and making sure all the loose ends and questions are answered while also tempting viewers with storylines that would be carried into the continuing Deep Space Nine and soon to launch Voyager. All Good Things... is the culmination of that, a tour de force of cast and behind the scenes crew in every sense. I have a soft spot for this final year of The Next Generation because of it being the one that I bought most of my videos from when they first came out - I had some cash, I was working part time and I'd truly discovered Star Trek. It's not my favourite year - that honour goes to season four on re-viewing reflection but it's a mark better than the fifth, first and second. It's odd to think that when I turned the DVD player off after All Good Things... it will be a while before I do a full end-to-end in-order watch again. Next up on the marathon are Generations, First Contact, Insurrection and Nemesis before we run into the seven years of the superlative Deep Space Nine. Warning, there's some highs and lows of extremely un-Vulcan-like emotion to come, but it'll be worth every second.